Ah… Technical difficulties, always a learning experience. The April posing is duplicated to connect it to this current blog. Doña Máxima took over at the helm of PAZA following Easter weekend when Dorinda made a hasty departure from Independencia in response to a family emergency in the U.S. The women of the Club de Artesanas (CdA) will meet once a week at Doña Máxima´s house. The Saturday morning program working with the teen girls will be discontinued until Dorinda´s return in July. 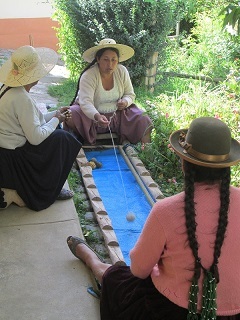 The chicas know they can work on their weaving skills during Club days at Doña Máxima´s house. Doña Máxima will open the PAZA store/workshop on Sunday mornings to work with the rural weavers who will be dropping off and picking up orders. Three months was spent in 2009 to simplify an accounting and inventory system that she could manage on her own. Although daunted by the responsibility and amount of money she must account for over the next 3-1/2 months, her body language said she accepted the challenge and she would strive to excel. The weavers have been riding high on the momentum built up thanks to the weaving orders received and completed the past 3 months. The momentum will continue as PAZA uses this opportunity to figure out how to operate if Dorinda needs to spend more time with family in the U.S.
Easter weekend went off as planned so Doña Mäxima´s grandchildren who had counted down the days until the Saturday for dyeing Easter eggs were not disappointed. 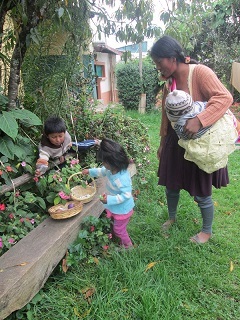 CdA member Adviana was invited to bring her children for their first Easter egg hunt. The prowess of those who had the experience last year was noticeable, but when the hunt was over the kids voluntarily divided up the treats in an equitable manner. On Monday, Dorinda and Doña Máxima discussed what needed to happen over the next few months and figure out a budget. One of the sewing machines, sewing notions, material, and a table were carried up to her house so the CdA women could work on sewing wing notions, material, and a table were carried up to her house so the CdA women could work on sewing projects. 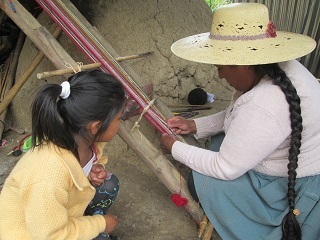 Funds were left for the CdA women to buy 5 skeins of yarn for crochet or knitting projects ($7 each). 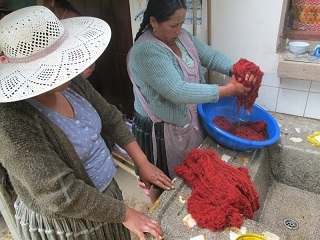 They will need to haul the dye equipment up the hill to Doña Máxima´s house for at least 1 more dye day for the popular cochineal reds. 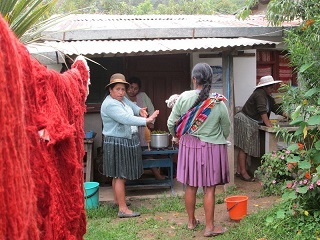 Travel expenses were figured for Doña Máxima to travel to Cochabamba to collect a wire transfer, drop off weavings for travel to the U.S., and to get cost estimates for the petticoat material that the CdA members will sew for the 2016 Spinzilla participants. All win first prize, and the weavers voted on a petticoat as this year’s prize. When Dorinda returns to Independencia in July it will be time for the Spinzilla team registration and putting together a budget for the fundraising effort. Last year $975 was raised almost covering the $1,005 in expenses. To complicate Dorinda´s last day in Independencia, a transformer in the neighborhood blew mid-afternoon knocking out electricity on the block. Once the sun set the remaining chores to close down the house and pack were done by the light of 3 candles. It is never easy to leave Independencia, but it is a luxury to spend time in the U.S., and always a pleasure to return to Bolivia. Thank you Lyn Lucas and Dorothy Thursby-Stern for your ongoing devotion and support of the weavers. Doña Máxima is ready to take on the responsibilities laid on her shoulders, but it has taken all these years of training and experience to set her up for success. Thank you Linda Switzer for your timely help. A huge hug and thank you to Susan Weltman for the donation she sent which is due to her savvy marketing of the weavings. 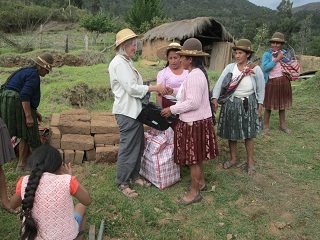 She not only marketed the weavings but came to Bolivia to pick them up! 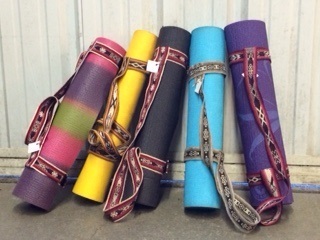 Thanks to Laverne Waddington, an order was received by Dorinda in the U.S., communicated to Doña Máxima in Independencia, and will arrive in the U.S. with the yoga mat straps Dorinda had ordered and originally planned to bring to the U.S. in May. The expenses needed to cover Dorinda´s emergency trip and extended U.S. visit would have been difficult to meet without the generosity of family members. Thank you all. Her sincere gratitude goes to Nancy La Scola for the visit and the PAZA support. The past month has been a reality check as to the financial imprudence of 10 years of volunteering. More help is needed in the funding of the PAZA activities. Spinzilla 2016 is rapidly approaching. 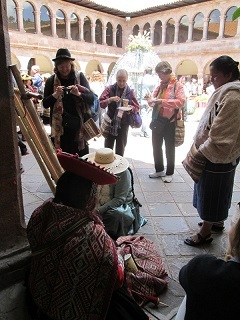 Looking further ahead the expenses to take 3 weavers to the Tinkuy International Weaving Conference in Cusco in 2017 will need to be met. Please help by purchasing weavings, making a donation, or helping to get the word out about the volunteer program. Inquiries for purchasing the weavings can be sent to dkdutcher@hotmail.com.